Binoculars are a vital part of your outdoor kit, absolutely essential for activities like hunting and bird watching they can also be useful for general nature observation, navigating in unfamiliar terrain, and even for casual astronomy and star gazing. Full size binoculars can be bulky though and however well armoured they are with rubber and plastic armour their lenses are still made of glass and inherently fragile, also the size, weight and distance between eye pieces of full size binoculars can make them difficult for children to use. For these reasons compact binoculars are particularly useful. When you can’t justify carrying a full size set of ‘binos’ a compact set might be your best choice, they will weigh less than half a full sized set, depending on model, and take up much less space. They can easily fit in a pocket or pouch or be a great addition to a survival kit without adding too much bulk or weight and due to their light weight won’t be uncomfortable to carry around your neck like heavier binoculars can be. Whether you are carrying a full sized or compact set of binoculars their tendency to swing around as you move, snag on things and get tangled with your other equipment such as backpack straps, map cases, range finder lanyards and other outdoors accoutrements can be particularly frustrating. Especially when hunting through deep undergrowth and you need to be quiet. There are specialist carry straps that are available from a variety of manufacturers that can make carrying your binoculars much more comfortable and depending on the design may also add protection to your binoculars in the form of a pouch or flap which covers them. For an affordable alternative to these sometimes very expensive pieces of equipment though you can make a very simple carry strap with nothing but a piece of paracord. This will hold the binoculars tight against your chest while still allowing you to move them easily up to your eyes. The relatively tight fitting strap also provides some added stability if you are using your binoculars without anything to rest them on as the tension of the strap helps to hold them very still. The strap also prevents the binoculars from swinging around and getting snagged or tangled, it can also easily be adjusted for traditional around the neck carry. To make a strap like this take a loop of paracord and a couple of split rings or other attachments like nite eze s-biners which will fit your binoculars at the normal point where the strap attaches. Form your paracord loop with a single overhand knot through both ends of the cord leaving several inches hanging free at the end. Now thread the loop through the s-biners or split rings which are attached to your binoculars and pull the cord so that the binoculars are at the middle of the loop which you can now fold back on itself. The knot where your loop closes should be in the centre at the furthest point from your binoculars, lay the portion of the loop without the knot between the two loose ends of left above the knot and tie a second overhand knot here enclosing the unknotted portion of the loop between the two knots, a third knot can be added for security. What you will not have is effectively two loops one running from one side of the binoculars to the knot and one on the other side. This allows you to wear your binoculars almost like a backpack, except on your front. As the loops go around your arms there is no direct pressure on your neck making it far more comfortable to wear and the thin paracord straps aren’t so bulky that they can’t be worn under a backpack or over heavy clothing? The fact that the loop of paracord runs freely means that as you shrug it on it will adjust itself to fit you and there will be no need for you to contort yourself or ask for help to adjust the strap at your back. 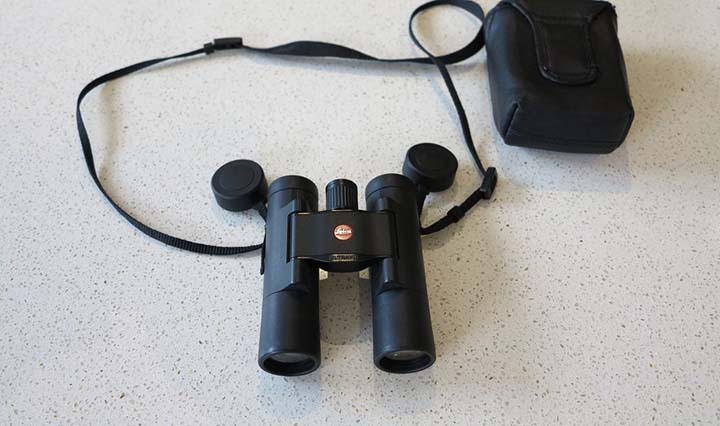 This simple carry system adds no significant weight to your binoculars and takes up hardly any space and I have found it to be the perfect carry solution for all binoculars from very heavy night vision models to tiny compact ones. For some activities binoculars are absolutely essential, hunting and bird watching are two that spring to mind as obvious examples. Lost or damaged binoculars during a hunting expedition or while out birding will be disastrous so carrying a light weight spare pair in the form of compact binoculars is very sensible. These can be carried in your pack or pocket without adding significant weight to your load and should you lose or break your primary pair you can grab these and carry on. They may not offer quite the same level of performance or function as a full sized pair but they will be far better than nothing and may make the difference between a successful hunt and disaster. This is especially important to consider on those once in a lifetime trips; to miss out on the buck of lifetime or for a decent look at that rare bird after saving and traveling because you dropped your binoculars on a river crossing or they got broken while in your luggage at the airport for the sake of an extra set of binoculars would be a real shame. Children often struggle with full sized binoculars, the eye pieces often don’t close enough to give them a proper look through both tubes, they are heavy, small fingers can’t easily reach the focus wheel and it is easy for them to get frustrated. Compact binoculars are often the best answer to this, ‘childrens’ binoculars are often gimmicks and more like toys than actual functional binoculars whereas a proper set of compacts can easily be used by a child. They are light enough to carry and will adjust to a child’s needs, relatively good compact binoculars can be had quite cheaply as well which is great for children, there is no point giving an expensive set of binoculars to a child who won’t understand the need to take care of them and who is more likely to drop them or lose them, start with something inexpensive and work up. Some full size binoculars are useful for star gazing and astronomy, compact binoculars generally aren’t. One of the ways that size is kept down is to keep the objective lenses quite small, it’s these lenses that gather light and help produce a bright clear image and the small objectives of compact binoculars aren’t really the best for this. They normally feature objective lenses in the 20-25mm range compared to full sized binoculars which normally range from 35-55 mm. For this same reason they don’t perform as well as full sized binoculars in low light conditions such as dusk and dawn, in fog and mist or for stargazing and astronomy as they just don’t have the capacity to gather as much light as their full sized counterparts with much larger objective lenses. With their smaller size they also don’t offer the wide angle view that can be expected from full size binoculars and you won’t get quite the field of view that you would from larger binoculars. So for low light conditions and situations where you need maximum field of view you might need to opt for a full sized set of binoculars. The small size of compact binoculars can also make them more difficult to use in the cold weather, especially with gloved hands, they can be quite fiddly, especially the focus wheel and so as a primary set of binoculars for use in cold weather they may not be ideal. All the best manufacturers of full sized binoculars have a compact offering and you are very safe with products from Leica, Swarovski and Zeiss at the top of the price range, these are a lot of money but offer the very best quality and for the money you can’t hope for better. Other brands like Bushnell and Nikon also offer great options . If you are considering a pair of binoculars for children consider some of the budget options which may not have the same quality of manufacturing as some of the more recognisable brands but will be very function as a child learns to use binoculars properly and while they learn to take care of them before trusting them with something more expensive. Compact binoculars mostly have the same features as full sized binoculars just on a smaller scale, but let’s have a recap of those features that you need to consider when choosing your binoculars. Many compact binoculars are just as powerful in terms of magnification than your average full sized binoculars but due to their smaller size they do generally offer less field of view and the smaller objectives don’t gather as much light making it difficult to take magnification higher than eight or ten as they just don’t gather enough light. I wouldn’t normally recommend a magnification of higher than ten in full sized binoculars anyway so this isn’t a disadvantage in compacts. Compact binoculars are generally going to have objective lenses between 20 and 30mm much bigger than that and they really don’t fit the ‘compact’ description and will be too bulky to carry in your pocket or to cram into a loaded rucksack. They won’t gather as much light as the larger lenses of full sized binoculars but proper coatings will still give you good images. The lenses are probably the most important single feature of a pair of binoculars and it’s the quality and engineering that goes into lenses that means the very best compact models still cost several hundred dollars and in some cases over a thousand. But they are responsible for providing the image you look at, for orienting it correctly and for gathering the light needed to transmit it to your eyes. Compact binoculars aren’t exempt from needing coating and you need to look for the same quality in your compact binoculars as you would in your full sized binoculars to get similar results in terms of image quality. Compact binoculars can be fiddly to focus due to their small size, look for ones that are designed ergonomically so they can be easily adjusted and even when you are cold or wearing gloves. Knurled focus wheels and well-designed binoculars will allow you to make these adjustments even on the smallest of compact models. Plastic or rubber armour is important in compact binoculars especially as they are likely to be crammed into a bag or pocket during journeys or stuffed into the bottom of a pack as a backup pair of binoculars on a hunting trip. Some of the models featured in this list are specifically designed for use around water for the fishermen and boaters amongst you and luckily for you some armour even floats and may save your binoculars from being lost so consider that when choosing your binoculars. While compact binoculars may be cheaper than full sized alternatives from the same manufacturer you certainly shouldn’t scrimp on them and should make sure they are properly waterproofed and sealed to avoid fog forming inside your binoculars. Most of the options you have in terms of compact binoculars will be roof prism designs but there will be a few porro prism options out there, while they may not offer any significant advantage in full size binoculars other than their shorter length compared to roof prism models compact porro prism binoculars often offer very large magnification compared which might be a factor you want to consider when making a choice. Offering the same premium quality as other larger Leica models the Ultravid compact packs incredible performance into a tiny compact package. Suitable for the traveling bird watcher and anyone who wants a simple light weight binocular for traveling or for a little bit of opportunistic birding during your normal day to day activities without the need to pack around a full sized set of binos. This model has an innovative feature allowing you to make adjustments to the diopter using the focus wheel, this cuts down on weight and bulk around the eye pieces and helps make this a really sleek package. Diopter adjustment is important when setting up your binoculars, this allows you to fine you’re your binoculars to take into account any slight differences between your eyes. You only need to make this adjustment once and after that you can make all the adjustments you need just using the focus wheel, with this Leica it’s the same wheel that adjusts both and a simple button allows you to switch between the two. To set your diopter first focus the binoculars on an object about 30-50 meters away. Once it is focussed cover the objective lens of the left barrel with its lens cap or a piece of tape and using the dioptre only adjust the focus of the right barrel until that object you originally focused on is perfectly clear. Sometimes no adjustment is needed but most people have subtle distances between their eyes meaning that they will focus slightly differently, it’s the diopter adjustment that corrects this and gives you a clear image through your binoculars. These Leicas are some of the best binoculars money can buy and you will be disappointed by any aspect of them, the 8 times magnification and 20mm objectives may not be the biggest here but the quality of Leicas coatings and lenses are so outstanding that they will perform better than inferior binoculars with much larger lenses. Zeiss has a well-deserved reputation for the excellence of their optics, particularly the quality of their lenses, coating and prisms. This compact binocular is a particularly innovative part of their lineup and its asymmetric fold allows it to fold up smaller than your average compact binocular even though it isn’t the smallest of the binoculars featured here. The 8 power magnification and 25mm objectives give you the power for bird watching and spotting but these could still fit in a trouser pocket or the palm of your hand. Not only do they feature Zeiss’s excellent coating to aid light transmission but the LotuTec coating also keeps the lenses free of water and condensation and allows dirt to be removed without smears or scratches. Most compact binoculars feature roof prism’s effectively giving them the appearance of two telescopes attached together, this model from Bushnell however features a porro prism design. Without an arrangement of prisms inside a set of binoculars the image you look at would be upside down. Prisms allow us to dispense with old fashioned erector lenses which led to overly large binoculars that were impossible to carry and also does away with the downsides of Galilean optics which do produce upright images but have very poor fields of view and low magnification. Porro prisms are named after their inventor, an Italian Optician named Ignazzio Porro, they were patented in 1854. Binoculars made in this style have objective lenses which are slightly of set from the eye piece making them quite short and compact and offering excellent depth perception and field of view because of their wide set objectives. Roof prism binoculars do tend to dominate the market now though both in terms of compact and full sized binoculars. Bushnell produce some excellent products and this is no exception, it will fill the role of affordable backup binoculars or perform adequately as a standalone pair if you have to travel light. 8 times magnification is acceptable in full sized binoculars so will not be a disadvantage in this compact set and the fully coated optics and BaK-7 prisms combined with bushnells warranty and reputation gives you an excellent set of binoculars. As with most of the compact binoculars featured in this list the Prostaff by Nikon features roof prisms. Roof prisms are by no means a new development and were first used in binoculars in the 1870’s with the design being patented by Carl Zeiss in 1905 after some refinement. Porro prism designs dominated until the 60’s though as high quality roof prism binoculars were more expensive to produce due to the time consuming and costly processes of aligning all the necessary lenses. Now though excellent binoculars are available featuring both porro and roof prisms and the narrow profile of the roof prisms seem to be the most popular. The Prostaff range by Nikon is certainly popular and this model is no exception at ten times magnification and with a 30mm objective these are quite generous specifications for a compact set of binoculars and there isn’t a lot of difference between them and some full sized binoculars and at under $200 these represent fantastic value. The 30 mm objectives are a marked improvement on the 25mm of most other compact options and the price makes this a great choice for those wo don’t want to or can’t shell out for the top of the range zeiss and Swarovski offerings but still want a good functional binocular. There is no point giving children an expensive set of binoculars and while these aren’t actually as cheap as a couple of the other options here they still come in at under $50 and the bright colour and robust rubber armour makes these a great option they will be difficult to loose and with withstand being dropped occasionally and will still perform well enough to satisfy the needs of an adult if need be. They feature ten times magnification and 25 mm objective lenses and will fold very small to fit the eyes of children, and can be adjusted for adults too. Manufacturing faults are covered by OUTNOWTECH 12 month warranty and they will be a great choice for getting your children started with bird watching. Swarovski manufacture binoculars specifically for hunting and are one of the best in the business, they do not make cheap products but they are worth every penny. The quality of their optics and the well thought out designs are perfectly suited to the discerning hunter and will not fail you in the field whatever the conditions. This model features ten times magnification and a 30mm objective so its features are barely any different from a full sized set of binoculars. It features Swarovskis proprietary lens coatings Swarobright for maximum light transmission and Swarodur for durability and water resistance. A stylish set of compact binoculars from Maven, these not only look great but they feature a practically indestructible aluminium body, this heavy duty aluminium construction does make it a little heavy but at 16.5oz it certainly isn’t heavy. It may not be the most low key of the binoculars featured here so although it certainly has the features for hunting the colour scheme may not appeal to everyone. The 8x30 specification almost competes with full sized binoculars but in this very compact package you really could carry this anywhere. The H20 series from bushnell are especially designed for use on or around the water, o-ring sealed and fully water and fog proof with non-slip rubber armour these will be great on board a boat, canoe or for fishing. You don’t need to worry about them getting wet and the added camouflage pattern on this model won’t spook the fish or game. Great for spotting fish rising in the distance or a bear on it’s way to steal your catch, or just for watching birds while you chill out on the bank these are a great little pocket sized option and also come with bushnells warranty and excellent build quality. Another binocular for use around the water this offering from TASCO is comparable to the H20 from bushnell with rubberized armour and waterproof construction. It is a little heavier than some of the other options on this list but at no more than a pound it is still very light weight and manageable. Easy to fit into a pocket in your fishing vest or jacket these are a great stylish option for light weigh binoculars. A slightly futuristic offering from Vortex Optics these reverse porro prism binoculars feature very sturdy rubber armour and all the quality you would expect from Vortext; one of the most popular binocular manufacturers in America. This model features eight times magnification and 26mm objective lenses, but a 10 power magnification version is also available and is a very similar size. At under $100 it represents fantastic value, the best of all those featured in this list. With the serpentine curves of the reverse porro prism design presenting the focus knob as the first thing you reach after the eye pieces this a very ergonomic design and would be ideal for use in cold weather, something that compact binoculars are not always good at. It goes without saying that the Vortex coatings and optics as well as their very high quality sealing and nitrogen purging of the tubes to maintain fog proof performance are excellent and will perform for you under the harshest of conditions. Binoculars are absolutely essential for any nature lover or hunter during their activities but these smaller binoculars can be carried anywhere so you can watch birds or wildlife at work not only that but compact binoculars can be great for general use: They fit in the glove box of your car and you can spy ahead during traffic jams to see what is going on. They are also really light and might be preferable for people who want to hunt with minimal kit and as light weight as possible. My best pick from amongst this list for hunting is the Swarovski, mainly because Swarovski are just so focused on providing the very best products for hunters. The time they spend in research and development to provide the very best products for hunters really pays off with their excellent products. The very best value are the futuristic Vortex reverse porro prism design at under $100 for the quality of Vortex lenses and coatings is fantastic and while maybe not in the same league as the high end Leica, Zeiss or Swarovski it is value that is hard to beat. For bird watching I don’t think you will be able to beat the Zeiss, they are so compact and feature the very best quality lenses and optics money can buy. It is also several hundred dollars cheaper than the Swarovski making it great value. For children the brightly coloured, well armoured and reasonably priced OutNowTech product will be a great choice. Whatever your special requirement for compact binoculars though, weather for your children, for hunting or just general use out of doors there is something here for everyone even if you are on a budget. Yes some of the more expensive ones are very expensive but if you have the money for them you really will see the difference between a zeiss and a tasco for example. Do stick to reputable brands though, you can find cheaper alternatives that look like they have the same features but they will have been cheaply made and not to the same standard or with the same quality control as the reputable brands, they may even be styled similarly but beware of them, they will not last and you won’t get the same warranty or customer service that you will from the big brands when your apparent bargain inevitably breaks. One final advantage of these compact binoculars is that unlike with full sized binos you don’t really need to consider weight they are all so light weight that you just don’t have to worry about it. You have no excuse to leave them at home or forget them you can fit most of them in your pocket so you don’t ever need to be without them.